I’ve been smitten with flower essences ever since I saw my horse Audelina responding so strongly to flower essences and I have now accrued a veritable forest of flower essence sprays from Lotus Wei that sit on my nighttable and my desk! So I’m thrilled to share with you step-by-step instructions on how to make your OWN flower essences. And then I’m going to walk you through how I made an essence from stinging nettle. 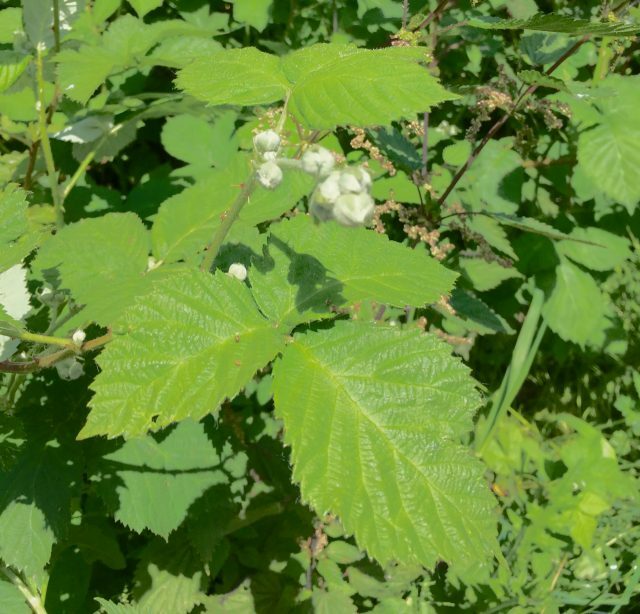 Tromping around my pasture I felt drawn to a couple of plants (stinging nettle and wild blackberry) and felt my body/spirit calling out for their medicine. The GREAT thing is, we can all make flower essences for ourselves or our animals fairly easily – just using the plants or flowers growing naturally around us. 2. Gather the blooms – Approach the plants and explain what you’re doing and why. Ask them which of them would like to offer their medicine to help humans (or horses) in this way. Pluck or break off only the flowers you FEEL are saying, “Yes, me!” Stop when you FEEL you have enough. You only need enough flowers to cover the surface of the glass bowl. Use a leaf from the plant to cover your fingers as you snap off the flowers (ask before plucking the leaf) and then you can either have the flowers drop into your glass bowl filled with natural water (ideal if you can), or you can drop them into another clean glass bowl, then transfer them to your bowl of water. Many feel we should not touch the plant with our fingers (transfers energy), so if you don’t use a leaf from the plant, then use clippers or scissors and cut them so they fall directly into your bowl. 3. 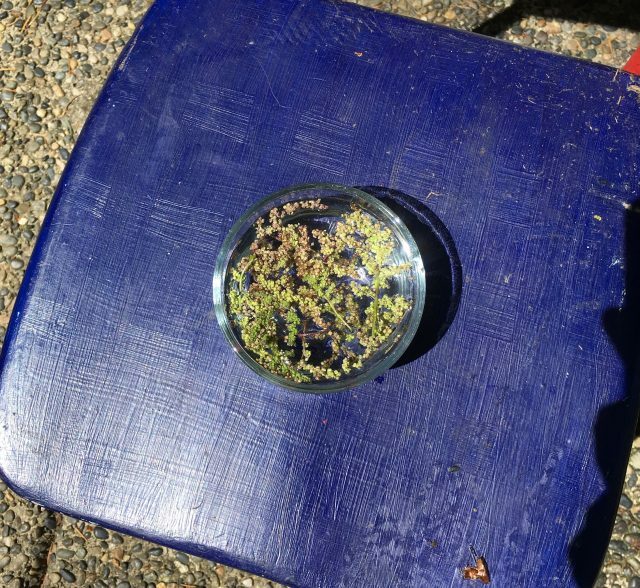 Use Solarization to extract the essence – Place the bowl of water with flowers covering the entire surface outside in direct sunlight for three hours. Make sure there are no shadows on the bowl from people walking in front, or the sun moving in the sky, etc. Alternatively, if you feel the medicine of a particular bloom aligns better with moonlight, then place it outside in direct moonlight on a clear night. Many feel the direct light of the full moon is most powerful. 4. 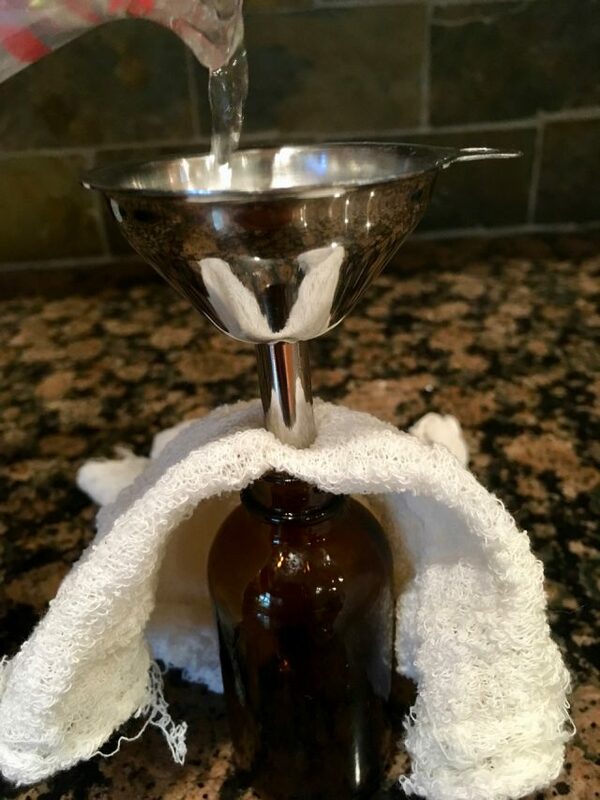 Filter the essence – Use a glass or stainless steel funnel to pour the water through a cheesecloth or coffee filter into an amber (or dark) glass bottle. You can also use a twig to remove the blooms first (makes it easier to pour). 5. 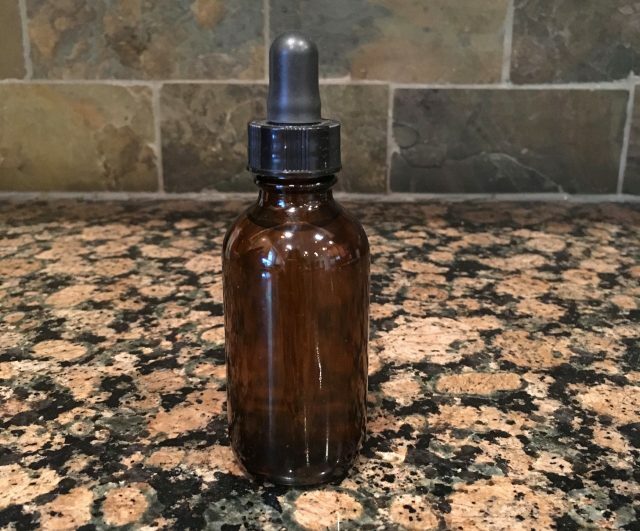 Preserve the essence – You can either keep this flower essence water in the fridge for 1 month and use it as is, or you can create a Mother essence tincture by combining it 50:50 with brandy or organic grain alcohol (at least 40% alcohol), or glycerine. Then you only need 5 drops of this Mother Essence per 1 oz bottle of 50:50 water/alcohol to create a flower elixir. If you made an alcohol or glycerin-based elixir, then you may also want to add a little raw honey and then place 5 drops of the elixir under your tongue, 3-5x/day. You could also add 25 drops to a glass bottle of water and just sip from that during the day. If you’ve kept the essence as plain water, you can add the plain (no alcohol) flower essence to a spray bottle along with some essential oils (when in doubt, Lavender or Rosemary are both good for natural preservation and a nice smell) and then mist your face or body with it 3-5x/day. You can mist your animals with the flower essence, or, you can spray it all around your own face and hair and go sit with your pet. You can add the plain water essence (no alcohol) to their drinking water. If you made a glycerin-based essence you may also be able to add that to their drinking water – depends how taste-sensitive your animal is. With my mare Audelina, Katie applied a roll-on essence of Infinite Love to her arm, and then my arm, and Aude stood motionless, just breathing it in, for a long time. For the next month, I sprayed the Infinite Love flower essence on my face and hair and would then go sit and cuddle with her. Now let’s go on a pictorial journey and I’ll show you how I made my stinging nettle essence. I have already been drinking nettle tea for a while, but my body is now calling for the vibrational essence – the energy – of stinging nettle. I recently went out with Kera Willis (another blog reader I recently had the pleasure of meeting in person!) and she would pluck a leaf right off the stinging nettle plant, with her bare hands. Tip from Kera: If you ever get stung by nettles, pluck a stinging nettle leaf, holding the topside of the leaf – fold it in half, then roll it up. Crumple/squash it to release some juices (if the leaf is dry, add saliva to moisten) then rub the macerated leaf onto the stung area and the pain etc will disappear very quickly. We had a chance to test this out as my brother was stung on his leg; Kera showed him what to do, and it worked as promised! I tested this a few days later by myself, but I used gloves to pick the leaf, roll it and squash it. When I applied it to my thumb, which had been stung earlier, it worked quite well, but not completely. Then I rubbed the same crushed leaf on a patch on my arm (which had not been stung) and my arm started burning! So I rubbed it on the same spot again, and the burning stopped. Weird! But effective. Anyway, not feeling brave enough to pick bare-handed like Kera (you see why I need nettle energy??) 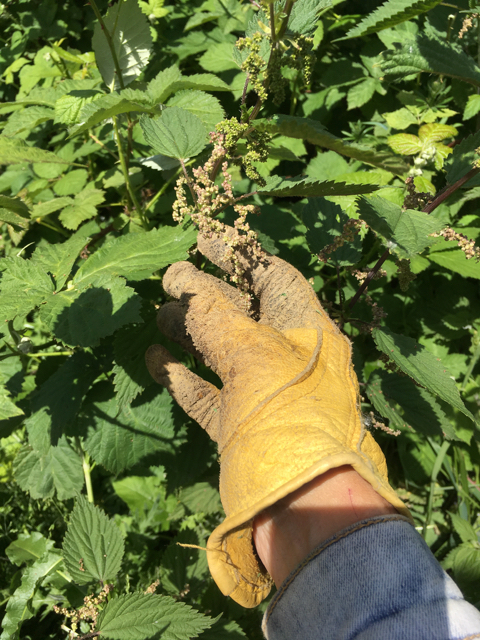 I wore gloves to collect the blossoming seeds of the stinging nettle plants I felt drawn to. They grow everywhere in my pasture, but I felt into which ones wanted to join with me in this endeavour and that’s the stand I went to. I then asked the nettles which plant wanted to offer a seed blossom to help me. As I was drawn to a particular stalk, I then asked which blossom I should take. Interestingly, I was only directed to take one blossom from each plant and then the plant/stalk said, “That’s enough.” So I stopped and went on to the next stalk. Cheesecloth folded 3 times to catch any stingers! I don’t want to make a tincture or elixir, so I’ve left my essence as plain water and will keep this in the fridge. The rest of it, I strained into a glass and drank – holding each sip in my mouth for about 10 seconds before swallowing. While I drank I welcomed the wisdom of stinging nettle into my body and thanked it for its gift and teaching for me. Every time I put some of this remaining essence in my mouth, or spray it on my face/eyes over the next few weeks, I will hold the same intention and gratitude. Why am I drawn to stinging nettle? 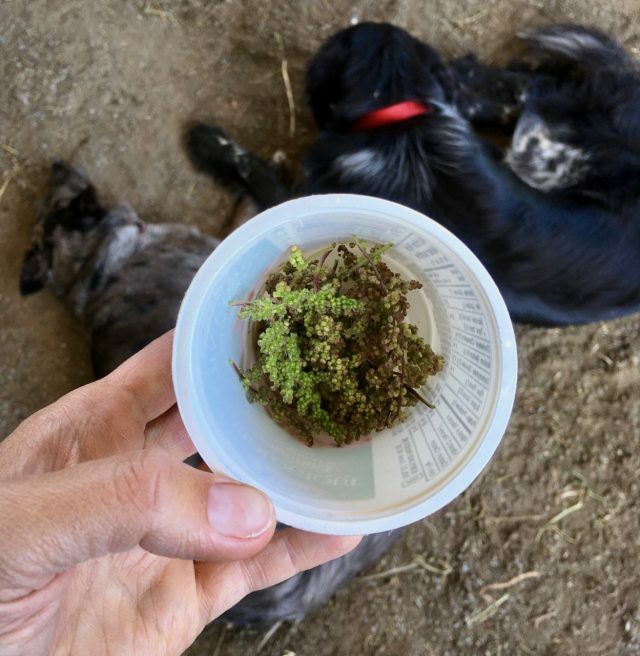 I love that we have SO much help and assistance available to us in the plant and animal world (my horses, dogs and cats also continually help and instruct me) – all we have to do is ASK and receive with gratitude. The next plant essence I feel drawn to is Wild Blackberry. Those of us who live with pastured animals are fully aware of the incredible tenacity, resilience, resourcefulness, fierceness and aggression of these plants! Yet their leaves nourish the horses and their fruit is exquisite to humans, birds, wasps, etc. What an amazing plant! And who could not use a bit of the fierceness of blackberry in their lives?? As you can see here, the blackberry blossoms are not ready yet, but now that I know how easy it is make flower essences, I will be watching and waiting for the right time to make this one! Horsetail is another plant that looks interesting, if you have that growing nearby. Take a look around your pasture or garden and see which flowers and plants call to you. 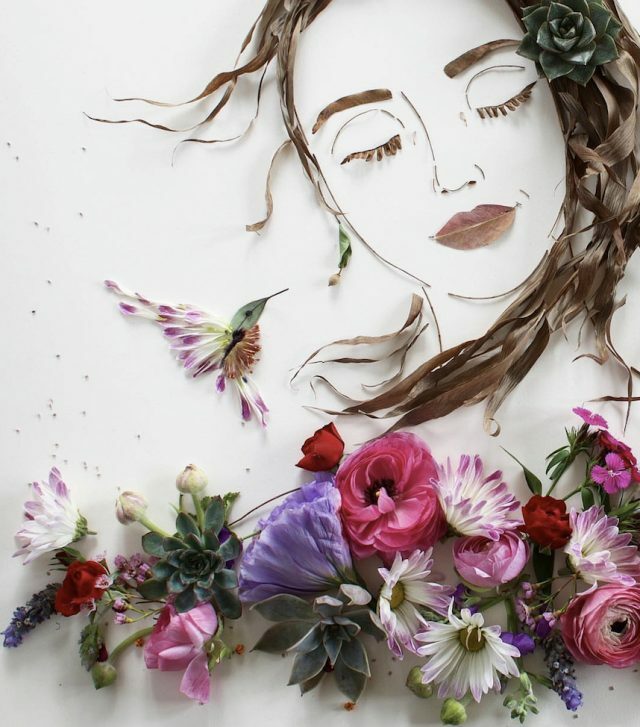 “Flower essences work through the acupuncture meridians of the body. They are the subtle but powerful energy of a plant that we cannot see or hear, stored in a bottle. When we take them internally or apply them externally they immediately travel throughout our own energy system, removing static and tuning any energies that are out of tune. A biofeedback experiment carried out by psychologist Dr. Jeffrey R. Cram using flower essences versus a placebo showed a clear and striking change in human electro-dermal response (EDA) to the flower essences, but none to the placebo. Many people have heard of the Bach Flower Remedies (especially in Europe) – an entire line of flower essences available in pharmacies and health stores. When I worked at a pharmacy in London (Covent Garden) 25 years ago, the Bach Rescue Remedy literally flew off the shelf – so many people swore by it! But it’s also great to have the option of making your own, out of any plant you feel drawn to! 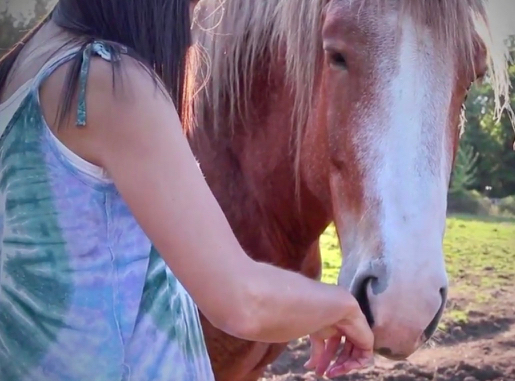 ← Horse Body Language – What does Pain look like? And here we go! Wild roses, geranium, columbine, buttercup, dandelion, raspberry and a little bit of this and that for flavour and spice, collected with the help of the dog-and-goat entourage, in the thick green bush being gnawed on by mosquitoes, with water from the stream where the bears and moose and centaurs sip, which flows around the cottonwood ridge and through the muskeg marsh, down from Sax Geen hill where I walked in wolf prints the size of my own hands, with the horses watching closely, while the rain sprinkled upon us all, left to simmer in the half-sun of a cloudy Kispiox afternoon, and watched over by a tacky little frog statuette for good measure. omg, that is fantastic!!!! Your bowl alone is wonderful, but combined with all the images/journey you gave us… thank you!! Where she tells us WHY we shouldn’t touch any of the plants for a while when we move to a new property…! Great read.. I have a rosemary and basil and lemon grass plants that I use and make as well. The plants are here for healing…. Will your horses eat the rosemary and basil? Mine won’t touch those two!